Laugh at my chimney and I'll tear you a new one! A. was kind enough to run a game of Iron Kingdoms for our group. With a name like that I assumed it would be an RPG with wargaming aspects. But actually it's just a Steampunk Role Playing Game with a design philosophy similar to D&D 4e. 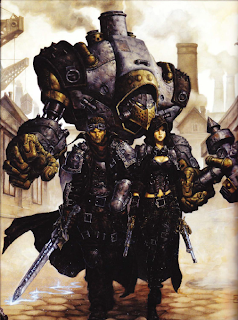 The first thing that struck me about the rules for Iron Kingdoms, while looking for the character creation section, was the size: a solid 350 pages, with 100 pages of setting info at the beginning. Why I need 100 pages of setting info was a bit beyond me, but there you go. Interestingly enough, the introductory adventure seems to have been inspired from WFRP 1e's introductory adventure, "The Oldenhaller Contract". The party is tasked with retrieving a dangerous artifact, but once they arrive they see someone has stolen it ahead of them. Anyway, we completed the adventure. Tracked down the Warpstone, or whatever, killed the thieves, got betrayed by the watchmen. All in a day's work. It was less engaging than "Oldenhaller", with few actual decisions to be made, besides how to attack. Plus no Nurgle trying to eat us.